The striking new Allianz tower, also known locally as ‘Il Dritto’ – the Straight, really does appear to scrape Milan’s sky. 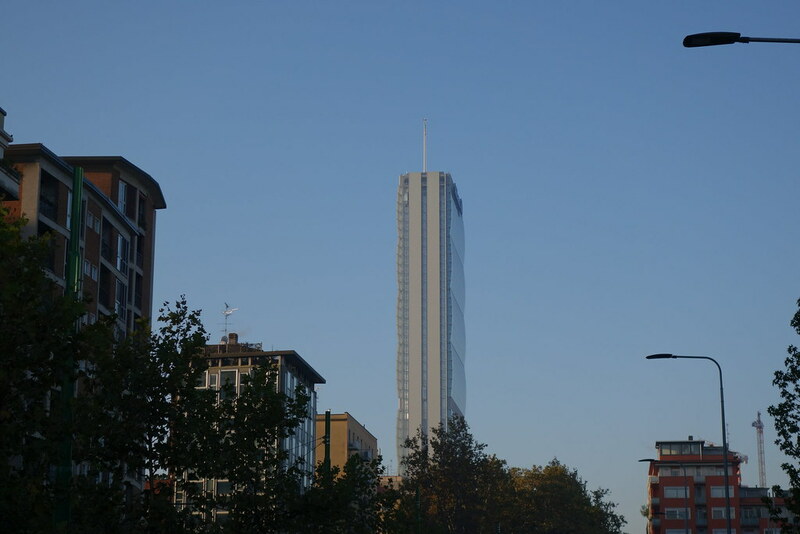 This new 207 meter (679 feet) high building (247 meters including the antenna) dominates the city’s skyline and is visible from many areas of Milan. It’s the seventh tallest building in the European Union and the tallest building in Italy. To put the height into perspective, the Allianz tower is around half the height of the fated twin towers of the World Trade Center in New York. The product of collaboration between Japanese architect Arata Isozaki and Italian architect Andrea Maffei, the 50 floor glass panelled Allianz tower has an area of 53,000 square meters (570,487 square feet). Construction of the Allianz tower began in March 2012 and ended in February 2015. There are 14 elevators of which 6 are panoramic. The cost of the tower was around €170 million. One imagines this pencil-thin tall building will sway noticeably in the wind. Milan, though, is one of the most windless cities I know of, so cases of ‘windsickness’ affecting the occupants of the top floors should be relatively rare. The view from the top of the tower must be stunning although this Milan resident has not been up to view it (he wouldn’t mind though!). German financial services giant Allianz is the owner, as you may have guessed from the name. If you can see the Allianz tower, you know you are not too far from the city center. It certainly stands out – as landmarks tend to. Sooner or later, a base jumper will launch him or herself from the top!